I'd like to tell you our story and how we were adopted by Benji. After our Cocker passed on aged 14 we decided to never get another dog. However the last few years have been tough, our eldest son emigrated and we then went through a pretty torrid 8 months when our youngest son's battalion were posted to Afghanistan. Our home was quiet and empty. Thankfully he came home safe, and we thought our luck had changed until we received the news my wife had cancer. The following months of chemo treatment were hard for her, and our son, who after leaving the army had become withdrawn and sullen, spending most of the time in his room, struggling to come to terms with his Mum's illness and we have since found out traumatised by his experiences in Afghanistan. One day, soon after my wife's last chemo session I was surfing a local sales website as I was thinking of selling an old aquarium I had. Suddenly this gorgeous little fluffy face appeared on the screen. It was a little Bichon puppy whose owners were having to rehome due to a change in their personal circumstances. I showed the advert to my wife and within the hour we were sitting in this very nice person's house with little Benji already snuggled in my wife's lap. The next day we brought Benji home, and almost instantly our lives changed. For the first time in ages there was the sound of laughter in our home, we couldn't believe this little ball of fluff could be such a character. He is funny, cute, loving, naughty, a bundle of unlimited energy who in just a few months has become a devoted companion to my wife who has now made a full recovery. They spend all day together and she takes him everywhere with her. One thing that makes me smile more than anything is the growing affection between Benji and my son. To see him in gales of laughter play fighting with this little ball of fun is heartening. Benji loves sneaking into his room and steal his socks off the floor and there then follows a chase around the house which usually ends up in a tug of war with Benji almost always wins. My son has now found a good job and life is now looking good for him. It's difficult to remember life before Benji, even though we have had him only a few short months. Today is a good example, instead of spending the day slouched on the sofa watching some rubbish on TV, we took a picnic and spent a lovely day in the countryside in the sunshine. That's something we would never have done before. One other thing I must add. 3 doors down the street I have a neighbour who I have never spoken to, believe it or not we have been neighbours for over 10 years and have never even said good morning to each other. A few weeks ago I started taking Benji over our local park and my neighbour was there with his dog. Our dog's started playing together and before long my neighbour and I were chatting. Our dog's are now best friends and we meet up most evenings on the park for a chat, he's a good guy and I would probably never would have spoken to him if we hadn't had our dogs! I've just read this back before posting and have realised I haven't really told Benji's story, its my families. So, apologies to all but I think I'll post it anyway! Best wishes to you all, and yes I love my Bichon. Wonderful stories, it comes out time and time again, just how much bichons enrich our lives! Steve, I think it's more about us humans than the pups when it comes right down to it. They fill the need within us and in return we try to repay them with a good life. I'm so glad Benji was able to make such a difference in your lives when life became so strained. Steve, what a touching story You definitely have a therapy dog in your home. So glad that your life is full of sunshine and white fluff. The best things in life. I went through an unpleasant divorce and had to leave my last dog with my x which was good for her, I lived in a unit for 12 months whilst deciding where I would buy a house,but knew once I bought my own home I wanted another puppy. I was parking my car in the local shopping centre and a man was walking past with two dogs, they were gorgeous I asked him what sort of dogs they were and he said Bichon Frise, I was besotted, he said he showed them and his sister was a breeder , he said they can sing and told them both to sing well it was magic. At that moment I knew I would have to have a bichon Frise. Six months later I bought a lovely house on the water and found a great breeder paid a deposit for Sally and 10 weeks later picked her up. Love at first sight she can be a little naughty sometimes but I put that down to being a puppy, though she is improving every day, she is sooooo loving and sweet, it took a lot of patience to house train her, however no accidents for a couple of months now, I absolutely could not imagine my life without her, she goes everywhere with me that is possible for her to come, she cries when I leave her at home, I have never taken her out without someone commenting on how cute and adorable she is. Sally has one embarresing habit she likes to sniff people private area I'm trying to teach that this is naughty but she does it so fast and when its a stranger omg it is funny but how do I stop her. She is already able to dance, loves everyone and is totally convinced everyone loves her. To have a Bichon is such a privledge will I get another don't really know just yet as I'm enjoying my special time with Sally. Great thread. I love hearing all the stories. Mine is a little different as I never wanted a dog and never thought about having one until one adopted us. Everything changed when a very small, very thin, white dog showed up on our doorstep in January, in the middle of a bad snow storm. I came home from work and found him there. I coaxed him in the house where it was warm. He was quite skittish and shy, but sniffed my hand and I sweet talked him. My hubby went out in the snow storm to get a can of dog food. I gave him a little bit and he gulped it down. I waited to give him a bit more as I didn't want to make him sick, eating so much too fast. We called the dog officer. He said that no dogs had been reported missing, but he had seen that dog earlier in the day, but couldn't catch him. Said he would be over in a while, which ended up being a couple hours. The dog got into my lap several times but didn't say long and was very nervous and restless. When the dog officer finally came, we asked what would happen to him. He said he would go the local shelter (just around the corner from us) and if not claimed would go to a formal shelter to be adopted out. I asked "what if we would like to adopt him"? He said that if he had been on his own, it might be that he is a problem dog and needs lots of work. He certainly didn't seem to be a "problem" while he was with us. The next night Hubby and I were at a large WalMart several miles away, and I happened to go by the dog section. Of course I had to look around. When we are in a large store like that Hubby and I split up and plan to meet in an hour, but when I came out of the dog section, he was right there. I grinned at him and said what I was looking at, he grinned and I said "you haven't said you wouldn't want to adopt him if he isn't claimed". We really hadn't talked about it. He said that he didn't want to deal with the vet bills. I told him that I would take care of the vet bills if he gave him a bath. He grinned and said "OK". The next day we told them that we would take him after the week was up. We paid the kennel bill and the rest is history. We named him Scruffy and he was the sweetest fluff you could possibly ask for. Needless to say we have been besotted ever since. Luana, What a great story! It was just meant to be that you had Scruffy. For the owners to either let him out or not bother to look for him in that kind of weather is unexcuseable. So glad he found you. Scruffy and Pepper are not the same, right? That is correct, Kay. Scuffy was our first bichon. We think he was a mix as his tail was cropped really short, about an inch long and his legs were longer than most bichons. When we had him groomed was when we learned he was probably part bichon. I had never heard of bichons before that. We had him 11 years when he contracted cushings disease. I have some pictures in Pepper's photo thread. Our next was a bichon/westie mix we renamed Charlie. His name was Yoda before that because of his ears. We only had him 3.5 years as he was a lot older than we had been lead to believe. We treated him for lymphoma for over a year before we had to '"let him go". 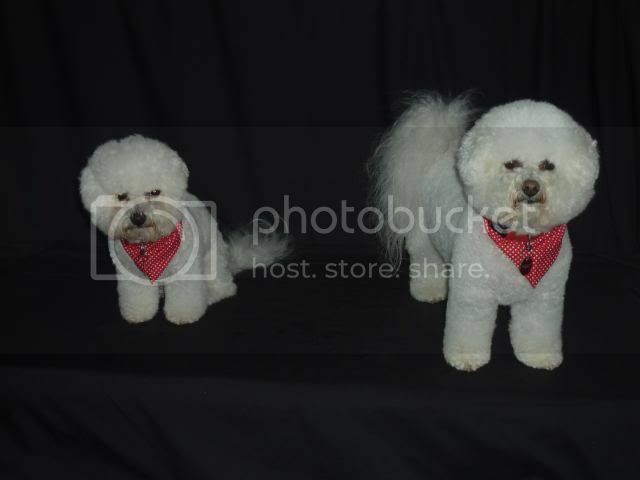 Then we decided to look for a full bichon and found Pepper on the "Bichon Club of America" site. They were excellent to work with. We had to take pictures of our area and house and answer a lot of questions and were finally approved. He was in Connecticut so we met half way in MA. Page created in 0.738 seconds with 19 queries.